Do not look at the 13 wines that entered the 2018 $10 Hall of Fame as a sign that all is well with cheap wine. Rather, this year’s Hall class may be the last great moment for cheap wine before we enter the dark ages of middling quality and overpriced wine. • Six wines dropped out, one more than 2017, and price creep reared its ugly head. The venerable Pine Ridge chenin blanc viognier, which has been in the Hall for a decade, can cost as much as $15 now. And it’s just not worth $15. • Just three California wines that aren’t McManis or Bogle in the Hall. That speaks volumes about how difficult it is to find quality cheap wine from California, thanks to exorbitant land prices and that most producers can’t afford to make cheap wine that’s worth buying. • The induction total was boosted by five roses, which says more about the quality of rose than it does about cheap wine. Take out the roses, and we had a very ordinary year. • Availability got worse this year, and it is going to get even worse. The wine business increasingly revolves around the biggest retailers like grocery stores, national chains, and the like, and the biggest retailers only want wine from the biggest producers. 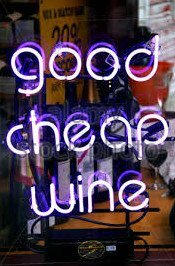 And most great cheap wine doesn’t come from the biggest producers. • The weak dollar, which has lost most of its value from this time last year, will eventually force an increase in imported wine prices — and most of the value is in imported wine. In other words, this may be the last Hall of Fame for a long while where this many wines are good enough to earn induction. The quality at $10, and even $15 or $18, isn’t there, sacrificed for “smoothness,” the chance to upsell consumers to equally inferior wine, and a resurgence in cute labels and marketing trickery. So celebrate while we can. The $10 Wine Hall of Fame 2018, and my annual assessment on the state of cheap wine, is here. You can also find it at the Hall of Fame link at the top of the page. The Hall’s selection process and eligibility rules are here. This year, I considered wines that cost as much as $12 or $13 to take into account price creep and regional pricing differences. Again this year, you’ll be able to print the Hall as either a text file or a PDF. Look for the icon on the upper right hand corner of the post.